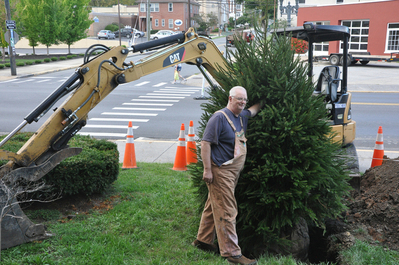 William Nicely takes some extra time to straighten a Norway Spruce tree that he installed in front of the Clifton Forge Town Hall on Thursday, Sept. 13, 2018. Clifton Forge, VA (Sept. 13, 2018) - Area businessman William Nicely and his wife, Holly, donated a Norway Spruce tree for the front of the Clifton Forge town hall today. As he was installing the tree, Nicely remarked that the tree was being donated to honor the memories of regional veterans and more specifically, the patriotic efforts of VFW Post 4299. * * * * *Editor's update: The Journal later heard that the tree would be moved. Town Manager Darlene Burcham quickly responded to our request for more information on this topic. Here is what she said: "The tree that Mr. Nicely told us he would provide was a large tree similar in height to those used in the past for the Christmas tree event. The tree he delivered, and which I learned just this morning was given in honor of veterans, is much smaller than requested and not suitable as our Christmas tree, and will be moved when we have the larger tree, to Veteran’s Memorial Park, where other items honoring our veterans are located." Mrs. Burcham just added that the Public Works Dept. has been given the task with securing a larger tree, which will be used for the tree lighting ceremony later. She also noted that the smaller tree, when relocated, can also be decorated if the veterans group supports that.